"Sampath Speaking" - the thoughts of an Insurer from Thiruvallikkeni: Suicides are to be hailed if only thy were that of Srirangam Vellayi ; Vanchinathan !! Suicides are to be hailed if only thy were that of Srirangam Vellayi ; Vanchinathan !! For Sri Vaishnavaites, Srirangam venerated as “Kovil” is the most reverred temple. 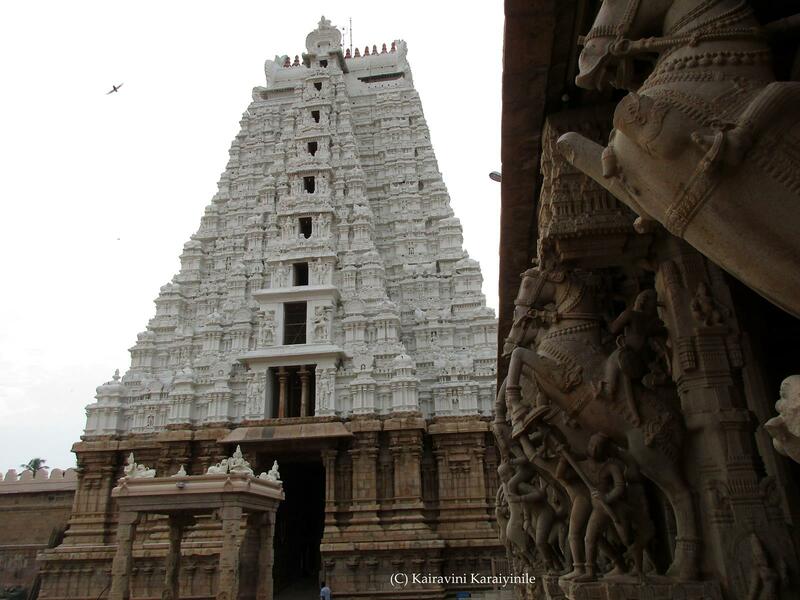 The history of the Srirangam temple is closely related to the development of the Srivaishnavism itself. The sthalapurana of Thiruvarangam, theSrirangaMahatmiyam traces the evolution of this temple from its inception as the Ranga Vimana, worshipped by Brahma in Satyaloka to its descent to the banks of the Cauveri. The entire complex is full of architectural marvel. It draws a lot of devotees from all parts of the world. The ‘Rajagopuram’ is 236 feet high with 13 tiers and is the tallest temple tower in Asia. On the eastern side, stands a tall gopuram, white in colour and popularly known as ‘Vellaigopuram’ ~ reading the history of Thiruvarangam, it is not the colour that give the gopuram its name, but a sacrifice – a sad story, indeed ! PunnagaiMannan, directed by K Balanchander released in 1986 had great numbers by maestro Illayaraja. The film starts with lovers Sethu and Ranjani (Kamal and Rekha) standing at a cliff and jumping off it in a suicide pact. Sethu escapes death but gets framed as a murderer .. it was another love story but was another movie that perhaps highlighted suicide as the culmination of love failure – in life there are successes and failures. One should not get desperate due to failure and certainly putting an end to one’s life is not the solution though some directors may keep glorifying such solution in their movies. A few years back, a man driving a luxury sedan, stopped his vehicle at Kotturpuram bridge, got out – jumped into the river – Corporation decided to raise the height of barricade, to prevent such occurrences ! !Suicide (Latin suicidium, from sui caedere, "to kill oneself") is the act of intentionally causing one's own death. Suicide is often committed out of despair, the cause of which can be attributed to a mental disorder such as depression, bipolar disorder,schizophrenia, alcoholism, or drug abuse or other conditions live love failure, failing in exams, social neglect etc., Stress factors such as financial difficulties or troubles with interpersonal relationships often play a significant role. Science reveals that animalstoo can suffer from mental health issues in the same way humans do: in particular they feel stress and get depressed, factors contributing to the act of suicide in humans. But is suicide among them? Do animals really, knowingly attempt suicide?For example, in the 1875 edition of the RSPCA journal Animal World, the cover depicted a stag jumping to a suicidal death. The accompanying editorial stated that "a wild stag, rather than be overtaken by its pursuers, will fall into the jaws of an awful death" ~ that is a different form and reason for suicide ..
English wicket keeper, DavidBairstow was found hanged at his home on January 5, 1998. He was 46. Reports said he had been suffering from depression: his wife was ill, he had financial troubles, he faced a drink-driving charge and was in pain from his own injuries. The news stunned cricket, especially as Bairstow had always seemed the most indomitable and least introspective of men, and led to much comment on the problems faced by retired sportsmen. David "Bluey" Bairstow was not merely the Yorkshire wicketkeeper but almost the embodiment of the country's cricket throughout the 1970s and 1980s. He arrived in county cricket amid a blaze of publicity when he was drafted from grammar school in Bradford into the Yorkshire side as an 18-year-old on the day he sat an English Literature A-level. Now read this disturbing report in TOI Chennai edition. A young couple died after jumping in front of a speeding train while holding hands in Athipattu near Minjur early on Friday morning.Horrified witnesses travelling on the train from Chennai to Gummidipoondi called the railway police after the incident at around 6am. The bodies of the duo were taken to the Government Stanley Medical College and Hospital for postmortem. Police identified the couple as A Akash, 21, and S Ramya, 19, both residents of Athipattu. Akash, a contract worker at a thermal power station, befriended Ramya who was a second-year engineering student at a self-financing college. Their families were against the relationship, said a police officer.“We received a call in the morning and arrived within minutes. Both suffered severe injuries and were dead even before we reached the spot,” said a railway police officer. The train was halted for about 20 minutes and services were affected for a few hours. However, normalcy returned by mid-afternoon, officials said. A case of unnatural death has been registered.Data compiled by the Indian Council of Medical Research shows that Tamil Nadu leads the country in the number of suicides. The National Crime Records Bureau has pegged the suicide rate (number of suicides per one lakh population) in the state at around 28% -- three times the national average. Society is to be blamed for we have wrong notions and wrong people as our ideals. Tinseldom often glorifies suicide ~ movies galore, where rich, good looking, well educated girl falls for rough, uneducated, illiterate roadside romeos – and justify such lumpen elements teasing girls with theme that girls eventually will fall in love with such crooks. Though some would jump to counter what is wrong – how many of them would accept their well brought-up daughter falling in love, eloping with one – who is illiterate and who has no job of his own. A director vent his ire when it happened in his family ! Getting back to the holy Thiruvarangam, the eastern side white towering gopuram – the vellaigopuram is also known as VellayiGopuram, named after adorable Devadasi called Vellayi who sacrificed her life to protect the idol of Namperumal. Srirangam was attacked by the Sultanate forces in the year 1323 during the Tamil month of Vaikasi. More than 13000 residents of Srirangam island laid down their lives fighting to protect the temple. The Islamic forces attacked the temple taking away its riches. Vaishnavite Acharya, Pillailokacharyar took the idol along and fled to Madurai. (The idol of Namperumalleaving Srirangam in 1323 traversed many places, went to Thirumala and returned back only in 1371). The looting marauders, the Sultanate forces killed the temple authorities, looted and plundered cattle and wealth, killing all those in sight. Fearing that the forces would capture the Acharya and the idol, Vellayi, performed a dance before the commander of the forces thus gaining time for Pillailokacharya to escape with the idol.Her dance lasted for hours together, she lured the commander to the eastern gopuram and pushed him down. After killing him, Vellayi jumped to her death from the tower chanting the name of Ranganathar.Hailing Vellayi's sacrifice, the chief of Vijayanagara forces, Kempanna, who drove away the Sultanate forces, named the tower after her. The gopuram continues to be painted white in her memory. There are sacrifices of people like VEllayi, suicide of martyrs like Vanchinathan – these are to be read and hailed – not others who put down their lives in other manner ! !